San Marco is made up of two churches placed one above the other, with the upper church opening towards the mountain and the lower church opening onto the valley. Dedicated to the Trinity, the churches are joined by an internal staircase and were built in 1580 by the Compagnia della Santissima Trinità dei Laici. The exterior of the upper church, which functions as the parish church of San Marco, is extremely simple. The baroque doorway is a later addition that was attached to the original 14th century façade. The decorations of the lower church are particularly fine and are made up of frescoed vaults along with a number of religious paintings. 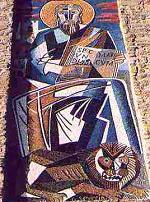 The façade of the lower church was unadorned until1961, when a large mosaic by Gino Severini (1883-1966).depicting St Mark (see photo) was un installed.